Reports gathered that the Lagos State Police Command arrested about 57 persons suspected to be involved in homosexual activities on Monday, in Egbeda area, Lagos State. According to the News Agency of Nigeria, NAN reports that the Lagos State Commissioner of Police, CP Edgal Imohimi, confirmed the arrest to newsmen during a news conference. He said that while the suspects were performing gay initiation rites for newly recruited members, they got them arrested and this was on Sunday at 2 a.m.
“Intelligence gathered revealed that some youths will be initiated into a Gay/ Homos*xual Club between 1 a.m and 2 a.m. at Kelly Ann Hotel/Events Centre, located at No. 3-7, Adenrele St., Egbeda, an action contrary to Section 1 (1) of Same S*x Marriage, Act 2014. 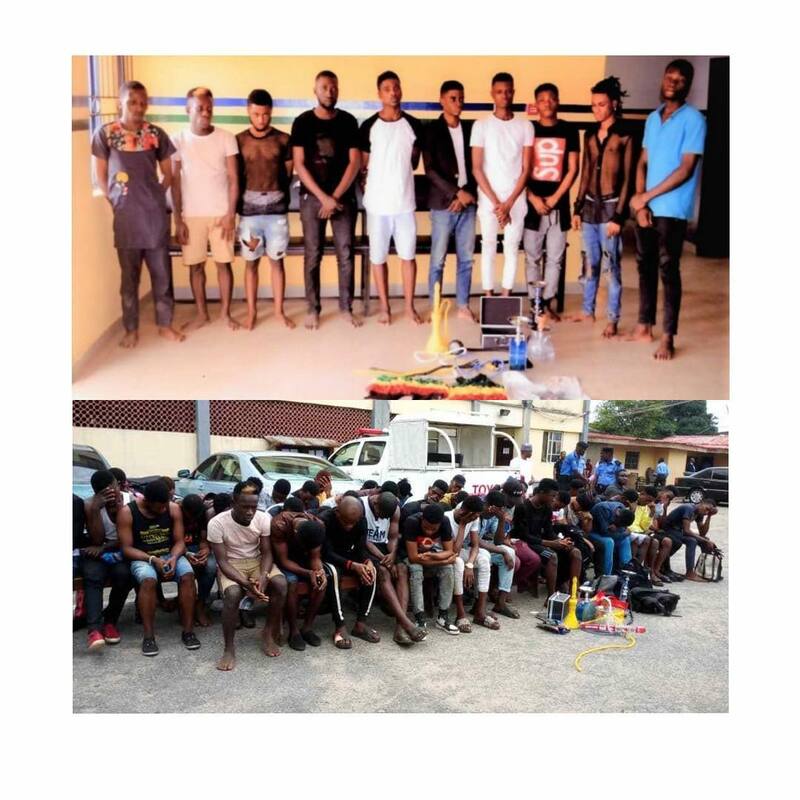 “They were taking different types of drinks, including banned substances such as Tramadol, and Shisha laced with substances suspected to be marijuana. The CP continued by saying that investigations about the case was still ongoing, also, that the suspects are soon going to be charged to court. Meanwhile, some of the suspects denied the allegations while speaking to the News Agency of Nigeria on the sidelines of the press conference. The suspects claimed that they were in the hotel to attend ceremonies. James Obialu,who is one of the suspects claimed that he was a dancer and had come to the party to perform before he was arrested. “I’m not gay, I’m a dancer and I was there to perform before I was arrested. I’m a responsible citizen and I work at the Alimosho General Hospital as a counsellor for those living with HIV”. the Yaba College of Technology and whose age is 22 stated that there were other females in the hotel who were not arrested. “I was there for a birthday party which started late. About eight ladies were at the bar with us, while some other ladies were dressing up in their rooms. “I don’t know why the Police refused to arrest the females but brought us here as alleged homosexuals,” he said. One of them named Bob China,said he was arrested while waiting outside the hotel and also said that he accompanied his friend, a caterer, to deliver food at the party.